I visited Venice for the first time years ago, in winter, trying to escape from the gloomy period that followed my grandma’s sudden death. Just two hours flying away I discovered a loving city that received me with open arms, solidarizing with my pain. The harsh wind and the low temperatures transformed Venice in a quiet town with its hidden labyrinth of alleys and narrow bridges helping me get lost on each day. The dim lights at each corner in the evenings, the emptiness all around, the casual gondolier blaring at me “hey ragazza, step into my gondola for a free ride”, the random laundry hanged between the buildings walling the canals, they all contributing to making me become and advocate of Venice. During that trip I didn’t really see the city, I just aimless walked around, reaching probably every corner of it but also take part at the mass from San Marco basilica, crying my heart out and lightning a candle for the soul of my grandma. Not that I’m religious but it felt the right thing to do. Leaving such a memorable print onto my life, I decided to return to Venice to spend my 30th birthday. This time I was coming back with a plan, to discover the city that was so good to me when I needed an escape. I arrived late in the evening and jumped onto the first vaporetto towards my hotel, paying an exorbitant ticket fare (7.5 euros) for just a 10 minutes one way journey. It’s Venice, I told to myself, I knew it was going to be expensive. I didn’t have the energy though to carry my bag around while trying to find my hotel, at midnight, so the comfort of taking the boat won over the budget worries. At the hotel, I had another surprise: the beautiful spacious Venetian style room I have booked was a dump. The tiny bed was occupying about three quarters of the entire space of the room, there was no window or space to leave my bag. I felt trapped, like I just stepped inside an ant’s house. I went downstairs to complain and I received a promise that my room will be changed in the morning. The receptionist also made sure to mention that other guests have paid much more than I did so I shouldn’t be unhappy. I didn’t really understand this part when I booked one thing and received something totally different, but I was too tired to argue so I just agreed to have it changed the following day. If you think the new room was better… I must disappoint you. It was maybe about 10 cm larger. I didn’t want this issue to ruin my holiday so I shrugged my shoulders and accepted that I’ve been scammed. Venice was however different than in my memories, it was crowded, chaotic, loud, expensive and extremely hot. Was it a mistake to return? I wasn’t ready to give up on it yet though. I came here to discover the city and I wasn’t going to leave without achieving my goal. So, I jumped into my “Venice dress”, covered my head with what I call my “romantic hat” and a put my pink trainers on (I’m afraid I’ll never be a fashionista), took a big breath and headed out left, on the narrow street my hotel was situated on. A few turns to the right, a couple of bridges crossed, another right corner and I found myself on a rather quiet street where I eyed a wine bar. “Time for chicchetti” I thought, so I sat down on the quite uncomfortable high chair and spread my territory all over the barrel which was standing as a table. Soon enough I realised that this was a proper local establishment, when the locals would pass by and pay 2 euros for a glass of wine through the open window, chatting with the bartender in the Venetian dialect. 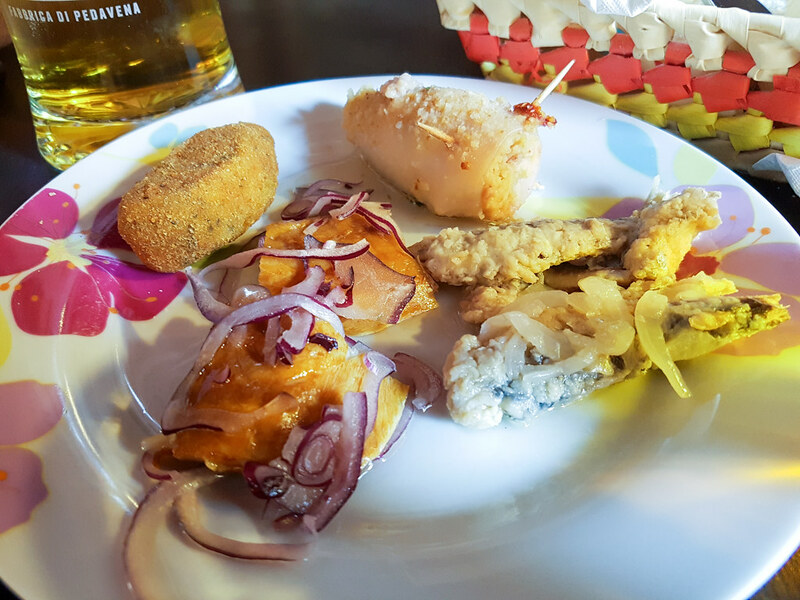 Chicchetti are small snacks served in traditional Venetian bacari (osterie or bars), a little bit like the Spanish tapas. They are cheap, delicious, and the perfect accompaniment for a drink. I chose a few fish dishes, including the sarde in soar, a typical Venetian dish: fresh fried sardine fillets marinated in braised onions, raisins and pine nuts. 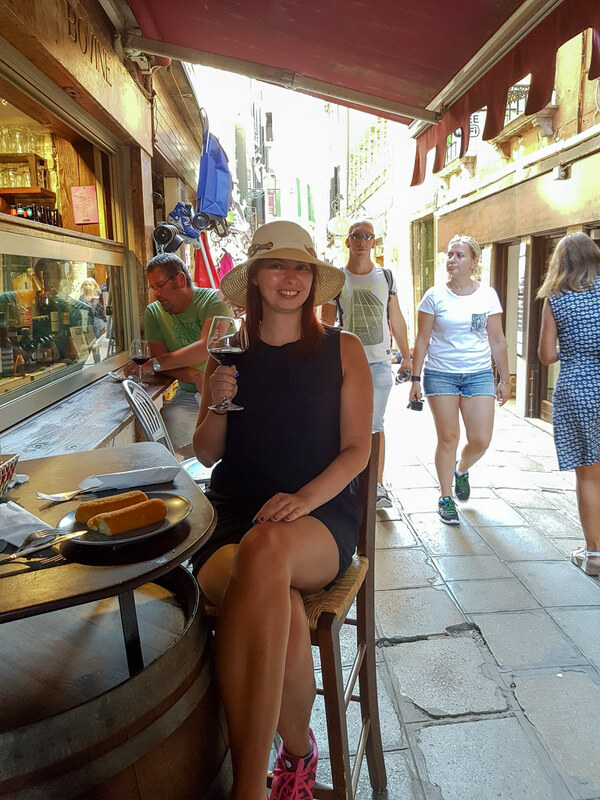 If you are a foodie, you should consider taking a food tour of Venice to try out the local cuisine and wines. Tip: While in Venice you should treat yourself to a glass of prosecco at some point. Treviso, which is just one hour outside the city and where you will probably fly into if you are getting here with a low cost flight, is also called the prosecco region because this is where the famous drink is made. If you have time you should definitely book a prosecco tour and go see (and taste) how the Italian champagne is made. As the clock struck six, I asked for the bill and headed over towards Campo Santi Apostoli where I was to meet Beatrice, the Local Guddy who would show me the hidden corners of Venice. Local Guddy is a website that connects travellers with locals who show them around their city in different unique and exciting tours. Beatrice was already in the square, waiting for me, so we have started our tour straight away. She told me that she was a student at the Venice university and we talked a little bit about life in the city, until we reached our first destination, Libreria Acqua Alta. She told me how Venice is slowly but surely disappearing as a local town: the prices are too high for young people to move in and it is too inaccessible for the locals who grow older year by year due to the numerous bridges and stairs. It was sad to hear this to be honest as I could see the huge difference between the Venice I visited in 2009 and the Venice I was in at that moment. On the way to Libreria Acqua Alta we passed through this beautiful square with not only one but two churches, united by a wall. Interesting, right? Basilica dei Santi Giovanni e Paolo dates from the early 14th century and it is one of the largest churches in the city. 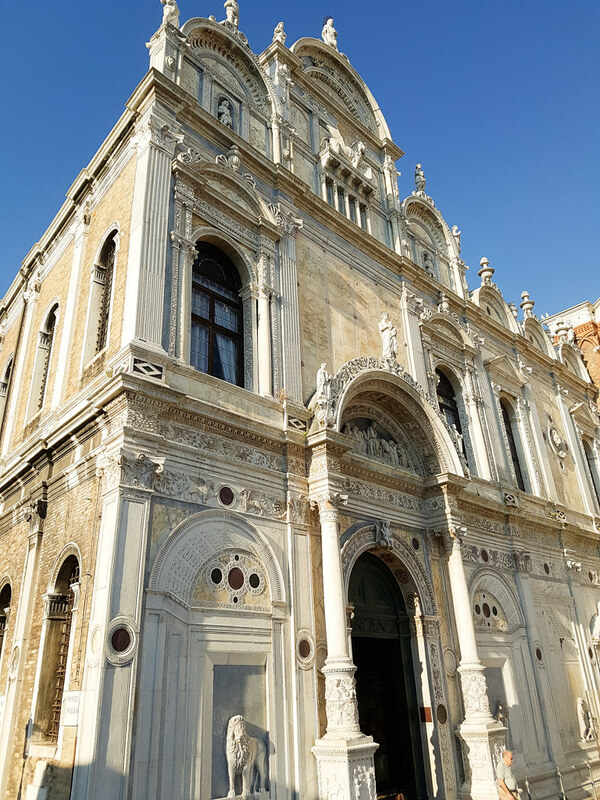 After the 15th century all the funerals of Venice’s doges were held here, with 25 having their graves inside. Next to it there’s the church of San Lazzaro dei Medicanti, now the hospital of Venice and in the past a school of arts. You can get inside and admire the beautiful paintings and fescues decorating the walls but you are not allowed to take photos. History says that between 1689 and 1693 the father of Antonio Vivaldi himself has given violin lessons here, at the music school. 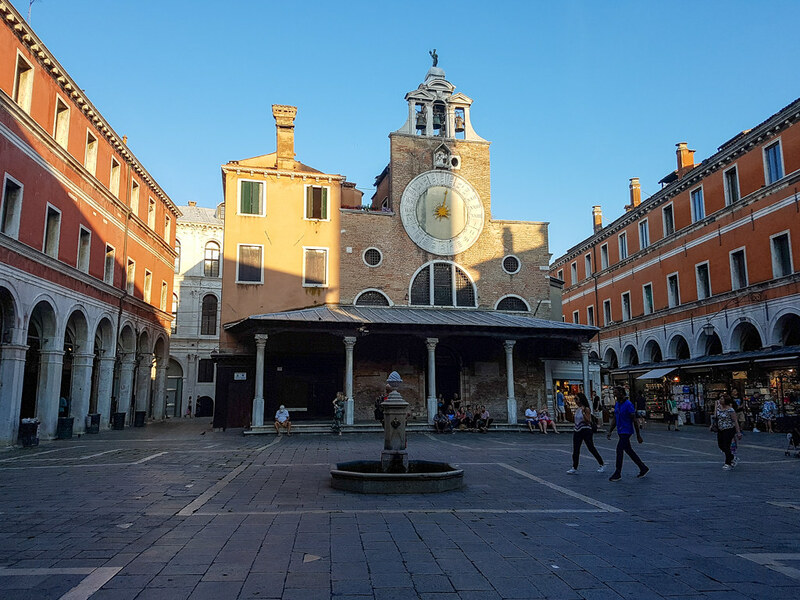 The square with the two churches, Campo San Giovanni e Paolo, is also the home of the oldest pastry shop (and gelato parlours) in Venezia. I have returned to Rosa Salva two days later to have a scrumptious breakfast, a coffee and, of course, a pistachio gelato. This café is one of those rare places in Venice where you won’t be overcharged because you are a tourist. We crossed a few bridges and walked a little bit until we reached Libreria Acqua Alta, a unique tiny library, a wonder of Venice, tucked in on an alley no wider than the length of my arm. 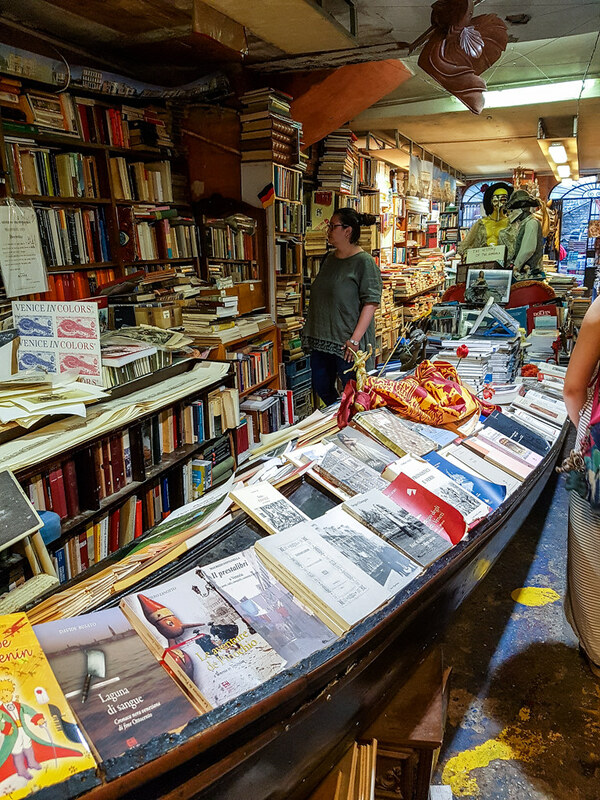 Once you step inside you are transposed into a magical world of books, with unusual shelves like gondolas, canoes and boats. There are so many books that some of them have been turned into furniture. 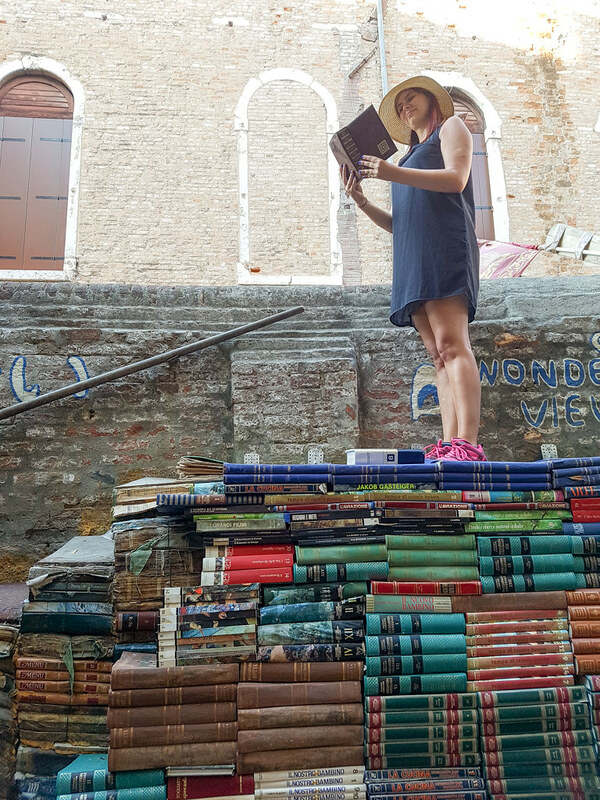 I guess Libreria Acqua Alta is probably the only place in the world where you can climb a staircase made out of ancient encyclopaedias. 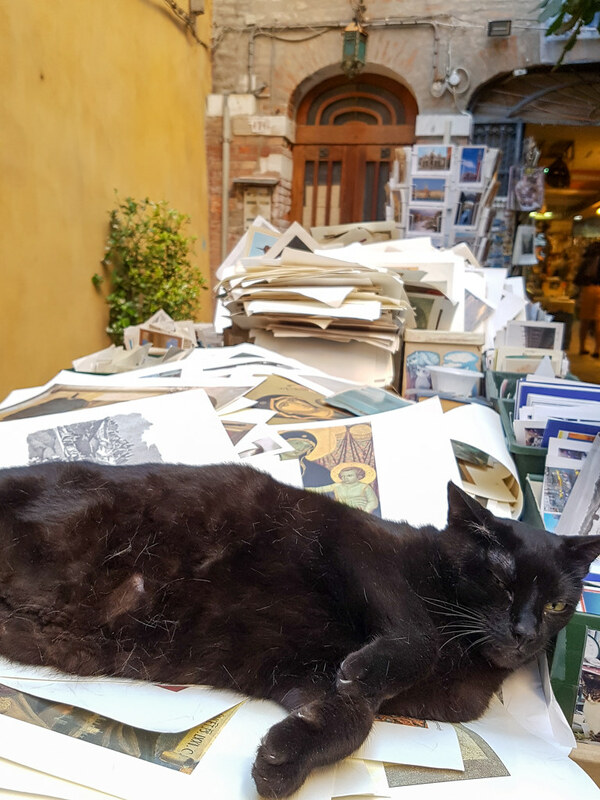 The library even has its own inhabitant, a black cat who didn’t seemed bothered by the tourists and simply continued his sleep, lying outside on a pile of religious prints. 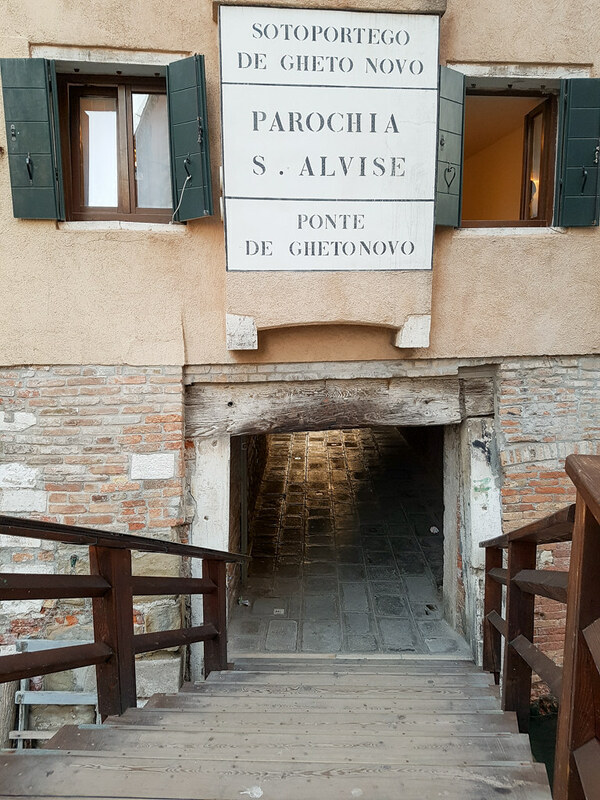 Beatrice told me that this is one of the secrets of Venice, there are not many people who visit the city and venture in this part of the town, Sestiere Castello to try to find it. It you are a book lover I would recommend you to pass by, you never know what limited edition you can find if you start searching through the piles of books. The next stop of the tour was supposed to be the Fish Market, but as we passed the busy alley towards Rialto Bridge, Beatrice suddenly stopped for a second, then turned around and got into the nearby building. I followed her and after a short question to the doorman, she signed me to join her. “Today we are lucky, the terrace on the top is open!”. We took the red carpet covered escalator to the first floor and found a window from where to admire the inside of the building. We were inside the Fondaco dei Tedeschi, an old historical building on the Grand Canal, the former headquarter of the German merchants. 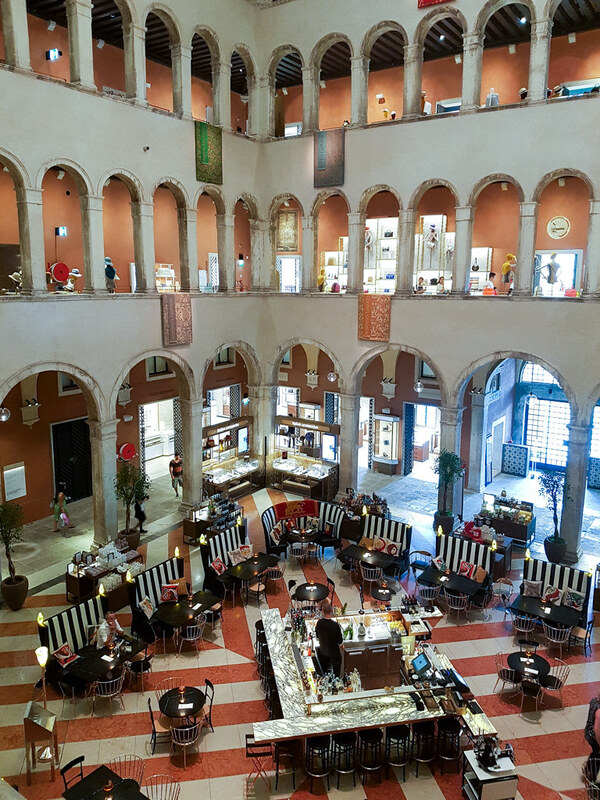 Today a luxury store, the building is fort floors high with an inner courtyard in the middle, built in the typical Renaissance style. 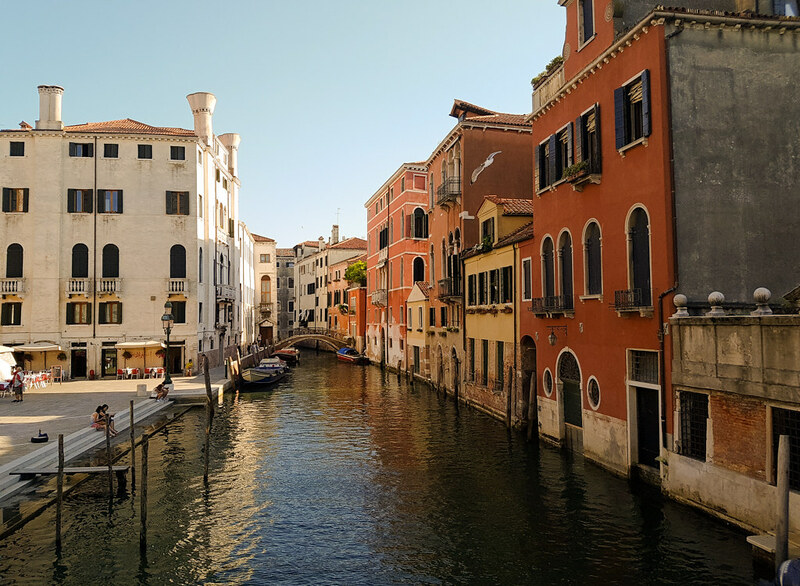 Beatrice told me that in the past Venice used to be a multicultural trading centre for goods, where a lot of merchants would meet, but each of the nationalities had their own “fondaco” – the market and living quarters of the community. In 1508 the façade of Fondaco dei Tedeschi has been frescoed by Titian and Giorgione but unfortunately due to the humid climate of the lagoon most of the work has been destroyed. The fragments which were able to be saved are now shown in the Ca D’Oro. During the last century, the building has been used by the Italian Post but since 2008 it was transformed into a high end shopping centre. You’ll have to trust my word that it is one of the most impressive shopping centres I have ever been to: imagine casually passing by a Chanel display sitting next to an arch from the 13th century, behind an exposed original brick wall. 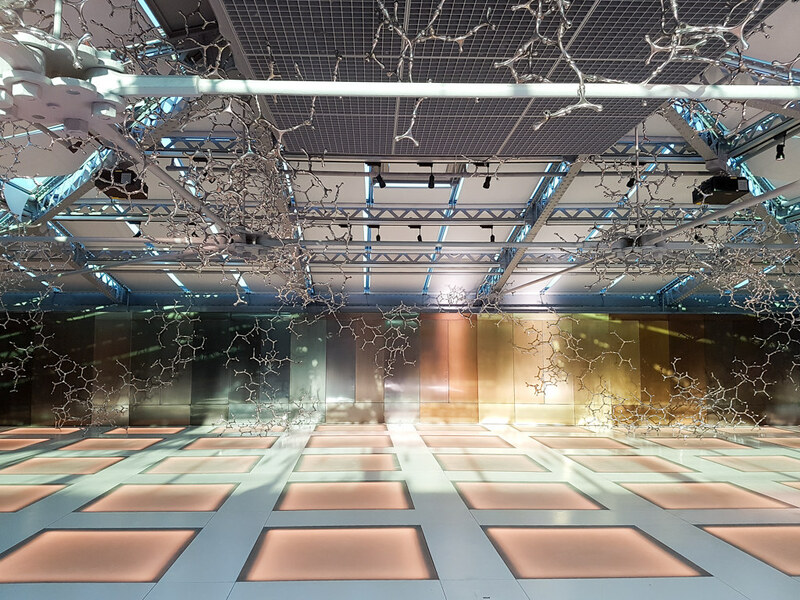 The top floor is transformed into a modern exhibition space which looks totally sci-fi. However, probably the best thing about Fondaco dei Tedeschi, from a traveller’s point of view (I told you I was not a fashionista so going shopping for a £500 handbag is not my thing), is the 360-panoramic roof terrace. As the sun was preparing to set, I met again there and then the Venice that I’ve fallen in love with. There were no more crowds, no chaos, no sounds. It was me, the shadows, and the golden light the sky is covered with one hour before sunset. I took a moment to just enjoy the view. As we passed by Canal Grande, ready to face the crowds again while crossing Rialto Bridge, still inspired by the views from the terrace of Fondaco dei Tedeschi, I spotted a wedding photo shoot so I took advantage of their set to take a snap of probably the most famous monument of Venice. 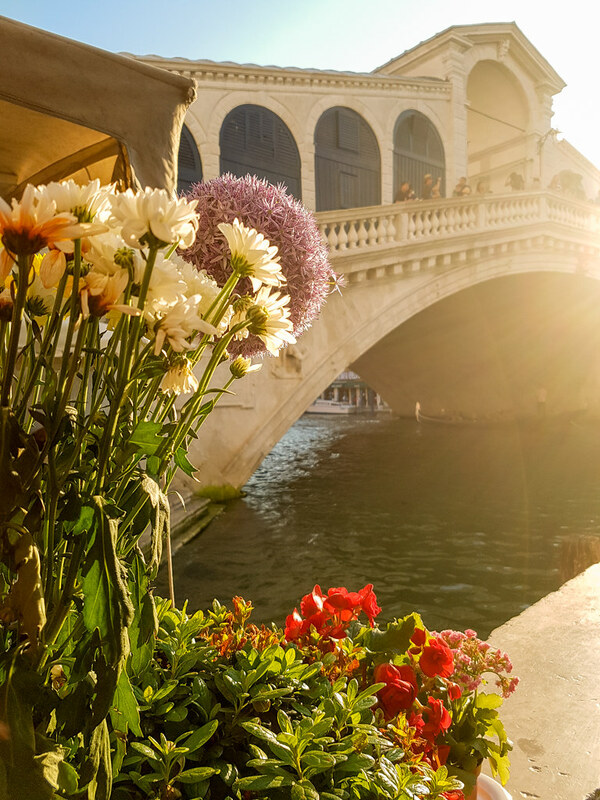 Built out of marble, Rialto Bridge is the oldest bridge across the canal, crossed every day by hundreds of thousands of people. Yes, that’s how busy Venice it is in summer! As a fun fact, did you know that Rialto was never thought to last too long because it has no support in the middle? However, standing up for over 425 years, it proved to be a Renaissance engineering masterpiece. We crossed Rialto ourselves to head over the Fish Market (well, the location of the fish market as it’s only open in the morning). There was nothing there but some beautiful views of the Grand Canal. However, we did stop in front of San Giacomo di Rialto church, the oldest in the city. 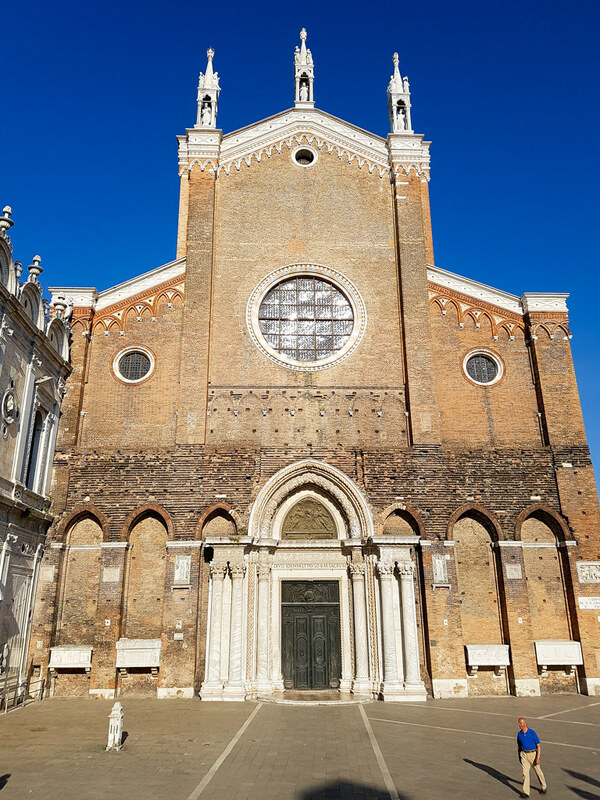 The modest church is loved by the Venetians because of its inaccurate clock. Ever since the 15th century, when it has been built, the clock never actually worked properly. Back in Cannaregio, Beatrice guided me towards Strada Nuova (The New Street), the modern part of Venice, built in 1871. It is the longest street in Venice, very wide, with plenty of shops and restaurants on each side. If you are looking for a supermarket, this is place to go, you will find two or three (one housed by an old theatre building). Please do not stop at McDonalds though, you’re in Italy and it’s a sin! There are a couple of places to visit alongside Strada Nova and one of them is the Casino of Venezia. 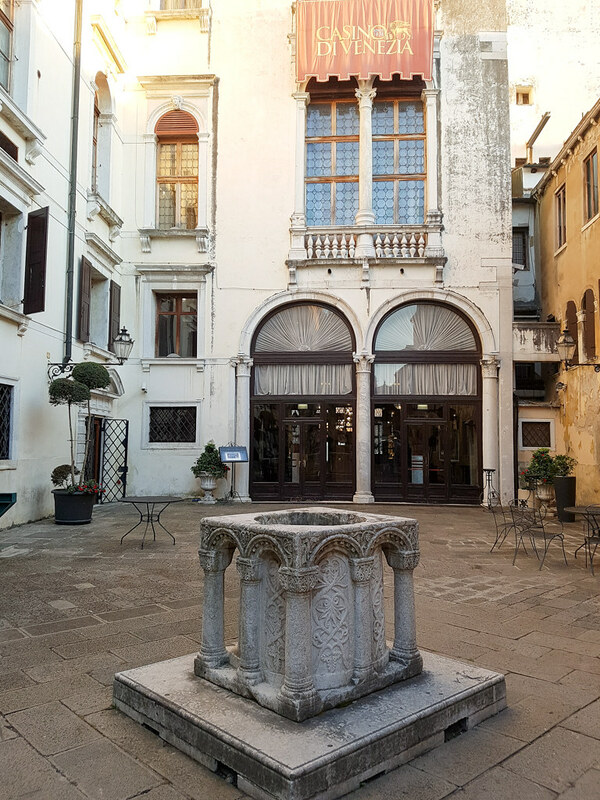 I don’t want to repeat myself but Venice does seem to have a lot of “oldest” monuments and the Casino makes no exception: it is the world’s oldest casino, dating all the way from 1638! Beatrice told me that from time to time they organise different parties that you can attend even if you don’t want to gamble. Apparently, the views from inside over the Grand Canal are very beautiful, especially by night. Out last stop of the day, after around 3 hours of walking, was the Jewish Ghetto of Venice. 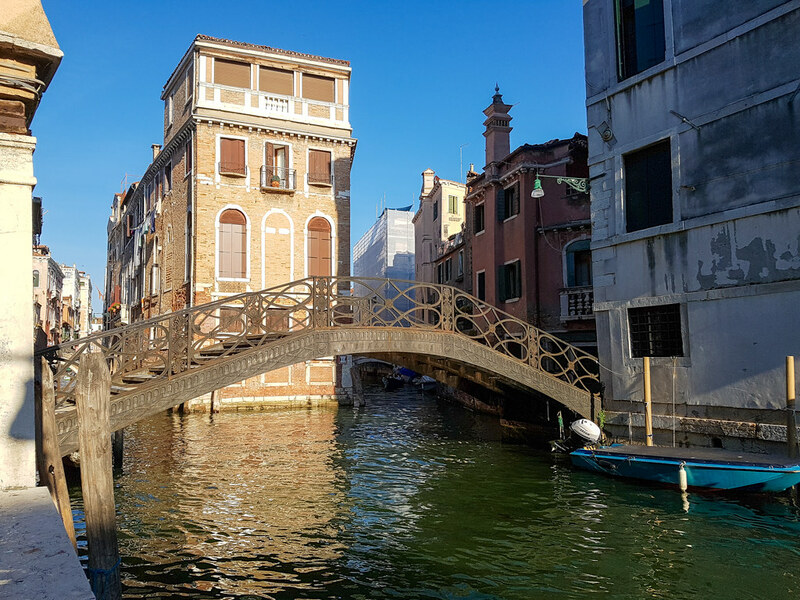 I was amazed to see that this community has its own “island” connected to the rest of Venice through three bridges, with their own synagogue, museum and art school, all guarded by a police post in the middle of Campo di Ghetto Nuovo. The Jewish community from Venice counts about 450 people which are very cultural active. I found the area to be very peaceful, with a few restaurants but no tourists roaming around. The tour with Beatrice finished as we reached Ponte della Guglie in time to catch the last glimpses of the sunset. We said thank you and good bye and I ended up my evening at a bacari, having an Aperol Spritz. Disclaimer: Please note that I was invited to take part in a complimentary tour by Local Guddy. However, all the comments and opinions in the article are my own. Your pictures are really beautiful. 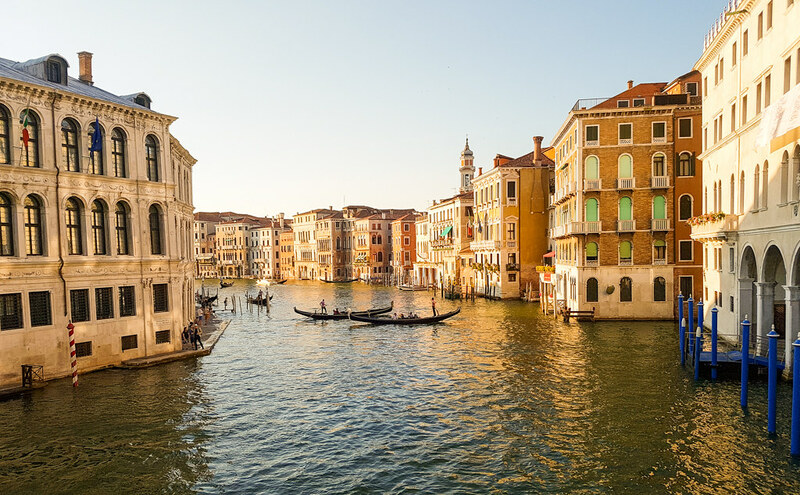 I am not sure the busy, hectic part of Venice would be enjoyable for me but with all the amazing history and architecture to see are definitely making it one of our vacation stops when we book our cruise! Venice is somewhere I would love to go and these look like some amazing hidden gems to get to see. I’m glad your trip turned into a good one. I haven’t been to Venice is more than 20 years, and I was fortunate that other than arriving without a reservation during Biennale and not being able to find a place in the city to stay, I was never there when it was crazy busy. In fact, I don’t think cruise ships were allowed in back then. 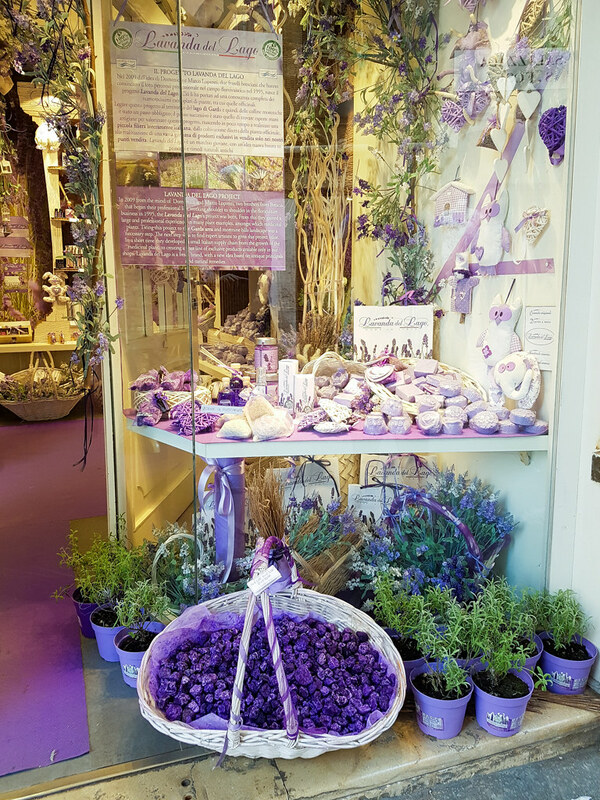 At any rate, it is a place of unexpected adventures and pleasures like your visit to the Fondaco dei Tedeschi and the lovely little shop with the lavender display. I am Jewish but somehow went to all the cathedrals and many of the churches but never visited the Ghetto. I’m glad you did, and I will next time. Beautiful post. Love your pictures. I have a bit of a love/hate relationship with Venice. We lived in Munich so it meant that it was a five hour drive for us, so it was somewhere we went A LOT. I would definitely recommend going out of season in the winter, or even in a period of really bad weather so you can guarantee that a lot of visitors won’t have bothered. Last time we went, I got up at 5am and went out to photograph then, it was just gorgeous! 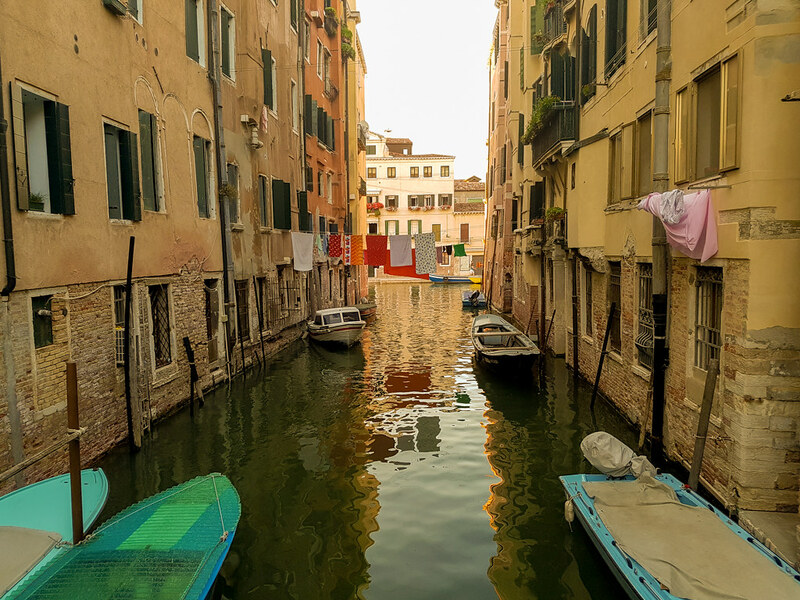 Your pictures are amazing thank you for bringing Venice alive on your blog. A very enjoyable post. Wow it looks incredible. I’ve always wanted to go to Venice and you have made me want to go even more! Isn’t it amazing that we can have totally different experiences of a place depending on when we visit it? Also, what was going on in our lives at that moment in time? I’m glad you gave Venice a second shot. It certainly was different to the first visit you described! Venice. Absolutely one of my favorites. You captured the heart of this fascinating city so well! First of all I glad this trip was better than you last one and I’m sorry for your loss. I know you do t want comments on your pictures but they are of some fascinating places. 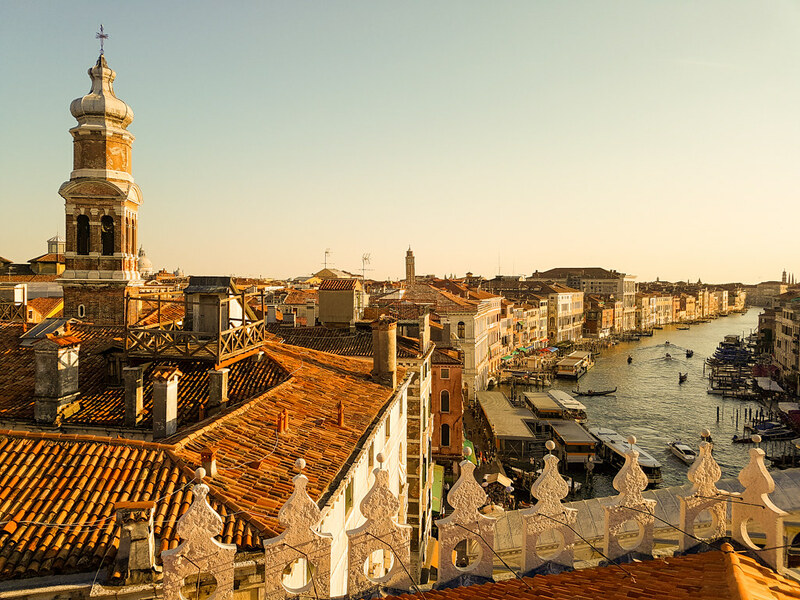 I love Italy, and Venice is one of the cities I want to visit so I loved reading about it. Thanks. I’ve heard of Local Guddy, but haven’t tried it out yet..I’ll have to look into it for my next trip. As for Venice, I’ve never been but it’s sad to hear that it’s slowly disappearing as a local place and just becoming more and more expensive (aka touristy). Woah! Glad the initial hiccup with the room and the crowd in Venice didn’t ruin your birthday at all! Learnt so much more about Venice today and also Guddy – due to your blog, I just registered myself on the site and it seems so cool! Venice is an amazing city. I love the food in the bars. I find the flavour combinations really interesting like the sardine with pinenuts and raising that your tried. Thanks so much for sharing this with us. I thoroughly enjoyed reading this post. oh my word your photos are giving me such major wanderlust! I’d love to visit Venice one day, it looks magical and so rich in culture and history! The perfect vacation! Ah, beautiful pictures! Venice is really beautiful. I have a friend who’s based there for work. She sends me lovely pictures too. The books! What an awesome find! I’ve only been to Venice once and even that was only for a day. It’s gorgeous but so crowded. Next time I visit I’m going in search of the books. I love the photo where it looks like you’re standing on them. Venice is, by far, one of my most favorite cities I’ve ever visited. I love trying to get lost through the winding paths! Omg the photos you took are absolutely beautiful! I think finding the “hidden” places are always the fun adventure once you are done with the locals. I’m so sorry for your loss. I visited Venice three years ago. I did the canal tour while there. But the next time, I plan to take a tour with more indepth information about the city. Very awesome photos! OMG this places looks magical. I love the photography as well. It seems like you ticked off every checklist of mine when in Venice. 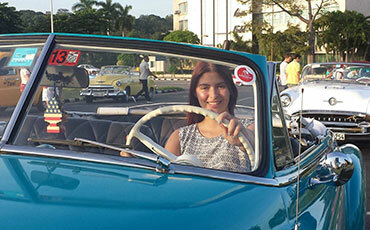 I love your photos too – great composition and angles. That sunset photo at the bottom is beautifully captured and well timed. You are lucky to see such a beautiful and romantic city. There seems to be beauty everywhere you look! The first time i visited Venice in 1974 we thought it was crowded and expensive. Id hate to find out what its like now. But yes, Venice is a city to get totally lost in, and its quite easy to do so. We wandered aimlessly around the old canals, and had so much fun. Your excellent photos bring back lots of good memories. It sounds like you had alot of fun. There were many interesting things for you to do. Sad to hear it wasn’t the Venice you had visited before. I would love to visit one day however, sad to hear it was croweded and expensive. This article is beautifully written. It’s unfortunate though that you had to stay at that accommodation. Do you mind telling which hotel this is? So that I could avoid it when we plan our trip to Venice. I wish I had visited Venice sooner! I’m afraid it might be completely different by the time we visit it. I love your photos as they show the romantic side of Venice! I’m glad your trip turned into a good one, especially after your last trip was so difficult. Venice is never somewhere that I’ve thought about going to but your pictures look amazing. 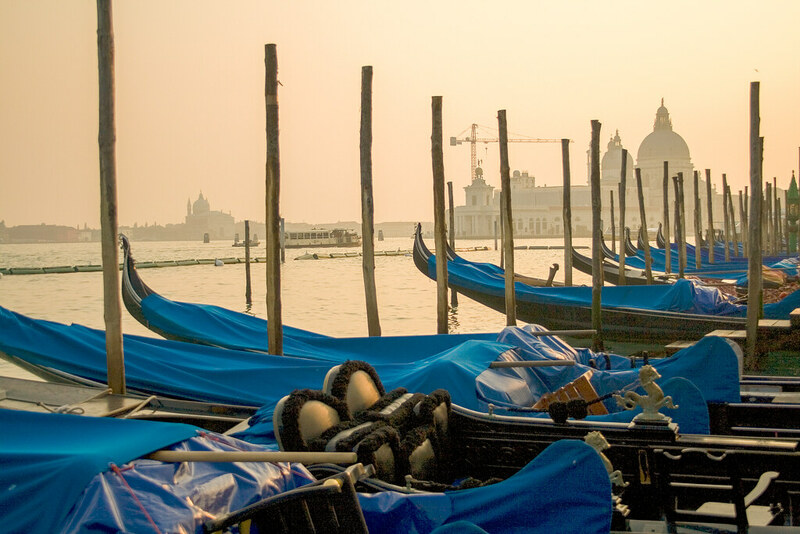 Though they are spellbinding in themselves, Venice has so much to offer besides gondola rides and waterways. Absolutely drooled over the piles of books! Gorgeous photos – I love the way they’re infused with that soft golden light. My first and only trip to Venice so far was in early January, and it was cold, foggy, and deserted – and I had a fantastic time exploring the city without searing sun overhead or tourists everywhere. I loved the moody feeling of the place, and I’m almost scared to go back again (at least in any season other than the dead of winter) because I’m pretty sure it’ll change my impressions of the city! I think it’s important to go back to the places we love. Sometimes we see big changes, and those might just be reflections of how much we have changed ourselves, especially if visiting a few years apart. Apart from the pleasure of reading your post, I really enjoyed your pictures. You captured some fine views of Venice. I am not a big fan of Venice, but I get its fascination. I should probably try going back again, as an adult now (last time I was there I was a teeager). 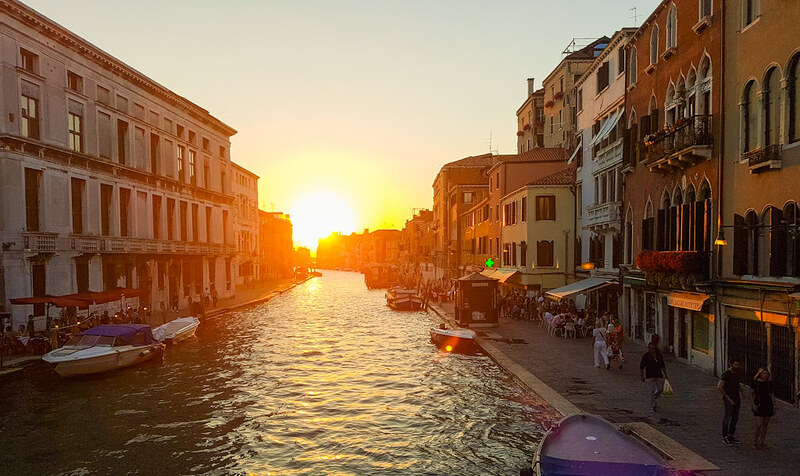 I visited Venice recently , 16 years after my first visit – and the difference was huge. I loved it anyway though. Your post brought back memories as I also visited many of the same places , including Libreria Acqua Alta. We also had a local guide on a free walking tour. I missed the shopping centre though. I know that feeling returning to a place. I think it was a good decision to not give up and try your best. Hi, I visited Venice about 11 years ago and it seemed (judging from your photographs) to be a lot more prosperous back in the early nineties……I’m sorry to hear that it has literally priced itself out of its past thriving economy. The fact that it is too expensive for its younger generation to continue to live there is a dreadful shame. Venice sure does look like a beautiful place to visit. I need to try and pop over for a weekend. It’s nice to read posts like this as they can give you a great insite before you go. I love the books. 😀 I wonder how much are those. I am so loving the place and hoping to find a limited edition one. Venice is such beautiful city and you have managed to capture it perfectly through your camera. Witnessing the sun rise or set in the canals, is definitely on my list of to do things in Europe. Venice has always been in my to-go list and the pictures make it look all the way more awesome..someday! Venice is such a magical place! I’ve only been once for a single day and it was too busy and chaotic for me to enjoy but your post and photography skills makes me wanna go back! I am so sorry you had that experience with a hotel. You did better than I would have. I would have been so upset. And it’s even more upsetting to hear all the changes that are happening that price locals out- that isn’t cool. And then they rip off tourists. So sad. But I love the black cat, that’s hilarious, and the book store. Such beautiful pictures! It’s nice to see a different side of Venice other than the gondolas. That library is so cool.As a book lover I would love to visit it someday! Really sorry to hear about your Grandma. Also too bad you got scammed ,but then again seems like you enjoyed later . Based on this, I have a feeling I would love to visit Venice! I love the idea of the “Local Guddy” – it makes so much sense and it such a great way to explore a new place. You managed to see & capture so many beautiful spaces – the basilica & book store are places I would definitely visit! Based on my visit to Venice, you’d definitely need to find the hidden spaces, so this is great. It’s visual, it’s thorough, and well put together! I am so sad to hear about your room, but I am happy that you got to find some hidden jewels there. Seems like you had a great guide. Such lovely pictures. Your post on Venice is quite unlike what I have been reading so far. I loved discovering the little corners of the place through it. Well done! Oh thanks for touring me through your pics. Amazing place to go. I do love the architectures and would like to feel the romance riding the Gondola. Hey. Some good pictures on Venice. I have not been there so it was education for me. Have you wondered what the locals do for food. Do they also have to pay so much for food? You have really explored Venice so well and have experienced it like locales. That library with full of books and also you have stated that some books are transformed into furniture which is unique. The market used previously by German merchants and now turned into luxury stores tempts me to visit. It is very sad that you were scammed. Venice is such a charming city that it always draws you back. It was a destination that was in our dreams and one fine day we found ourselves there. The shortage of time meant we covered just the main attractions. Hope to get back to explore the hidden and unseen treasures of Venice. Happy birthday Joanna! And I’m sorry to hear your trip didn’t get off to the best start. I loved looking through your pics and reading about your day, though. I’ve always wanted to visit Venice, and after seeing your pics I want to go even more!! 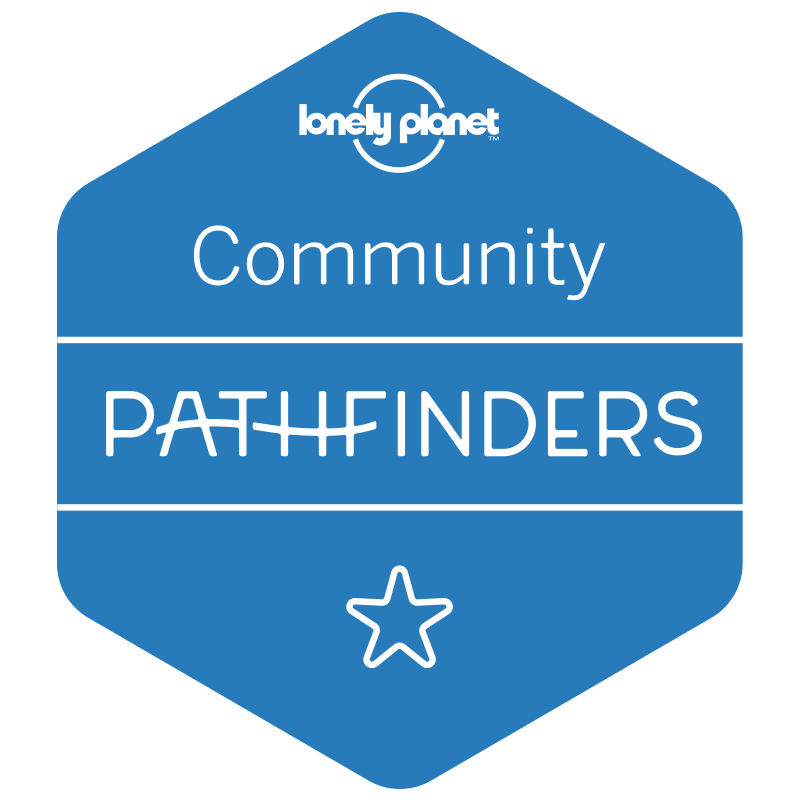 I have recently started using locals to show me the place and totally loved it. Local Guddy sounds just the team I might want to contact and see a place like the locals do. You had some great experience and seeing Venice of the old is a brilliant idea. I loved the sunset you witnessed over the canal ! BEAUTIFUL! I love Italy so much, and I’ve never even been. Happy Birthday!! New buck list place. It look amazing. When I go to new places I find out where the local are and thats where I like to go so I can really take in the country. Those are some nice offbeat gems. Often we tend to overlook such gems when visiting a popular destination. I am sorry to hear about your grandma. Good, travel helped you to distract yourself. I am usually not a big fan of Venice, but your pictures are so beautiful that I want to come back now! Thanks for sharing this beautiful travel inspiration! this looks and sounds like heaven! I have family that live 20 minutes away and would go every time to Venice for a night. miss those quiet, hidden streets. Italy is easily my favourite country but I have yet to discover the wonders of Venice. It looks amazing and I love your photos. Been there but not done that! I couldn’t find these places at all on my trip last summer! These are some great ones! I would be going there soon! Thanks for sharing! Cheers! Glad you had so much fun in your adventure in Venice!..There are many beautiful spots there, Venice is one of the most attracting and amazing places in the world..
Wow! I truly love finding and exploring the hidden gems! Venice is truly stunning! I would love to visit Sestiere Castello. What time of the year would you suggest going there? I would recommend you to visit Venice in late autumn or early spring. That is when the tourist season is at a minimum and you can exploer the city in peace. Happy 30th birthday! What a way to celebrate. Sorry it wasn’t exactly as you’d expected, but it sounds like it was a fab trip in the end. I have always wanted to go to Venice, it’s definitely on my bucket list and it sounds I should visit sooner than later! I love Venice. I have always dreamt of being able to visit Venice one day. It always seems like Venice holds so many secrets and so many stories that could be explored. And happy belated birthday to you! I’ve never been to Venice, oddly enough. Always on the top of my bucket list though. Your pictures are amazing. I have a love hate relationship with Venice. I love it as it was our last stop on our Honeymoon in Italy, but I also felt it was too hyped up and although very beautiful, Florence and Rome were so much better. I love Venice and even though I’ve been a couple of times I’ve never come across this tiny library before! Now I really want to see and explore it. Your photographs are beautiful too. Venice is definitely on my bucket list. One day… one day! Wow you look amazing. I have never seen that side of Venice before. This place is already on my bucket list and now you pictures made me wanna go there fast. Love Venice and the story you shared. Venice, to us, is most magical early in the morning, when one can wander the streets accompanied only by the quiet hum of locals talking in the few cafes open at that time, and markets just opening for the day. Pure magic. Wow I loved your photos, they’re so beautiful. Love that you got a chance to visit some sights that are unique and not the stereotypical touristy spots. Glad you enjoyed the trip even after the rough start. Venice was beautiful when I went. I wish I could go back since I was only there for a day I feel like I didn’t get to see as much as I would have liked. Great post, thanks for sharing ! That bookshop looks like a dream to me! I mean, so does all of Venice, but I’m partial to beautiful bookshops. I love your photos! I was in Venice a couple years ago. However, it was a very short day trip as we took a train from Rome. I wasn’t able to explore as much as you and I wasn’t impressed with how crowded it was. This post is beautifully laid out and written, I now want to go back to spend a full day or two exploring Venice. I enjoyed reading your adventures, though I’m not a shopping either but the most that I’m attracted to is the t Fondaco dei Tedeschi I would love to go there just simply take some photos around. I haven’t been to Venice so this one will be on my list. This makes me want to hop in a plane and head to Venice right now. Sigh, it looks BEAUTIFUL! I love that it’s built for walking.